The relative movement of the crack faces is the COD and it is twice the value obtained by Equation 2.2.55, i.e. 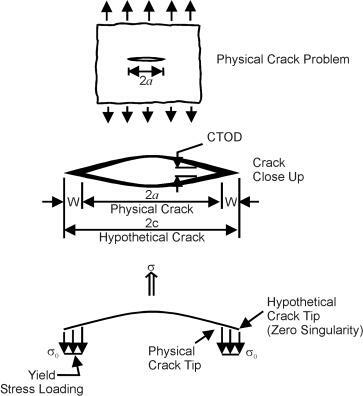 It is immediately seen that the CTOD is directly related to the stress-intensity factor for elastic materials; thus, for elastic materials, fracture criteria based on CTOD are as viable as those based on the stress-intensity factor parameter. The other relationships developed between K and G or J in this section allow one to directly relate G and J to the CTOD in the elastic case. where the constant a ranges from about 1 to 1.5. 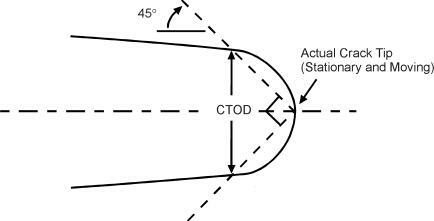 Experimental measurements [Bowles, 1970; Roberson & Tetelman, 1973] have indicated that a is close to 1.0, although there is substantial disagreement about the location where CTOD should be measured. For the case of plane stress behavior, dn is unity and for plane strain behavior, dn is about 0.78. For strain hardening materials controlled by Equation 2.2.45, Shih and co-workers [Shih & Kumar, 1979; Shih, 1979] have shown that Equation 2.2.64 relates J and CTOD if the constant dn is replaced with a function that is strongly dependent on the strain hardening exponent and mildly dependent on the ratio so/E. 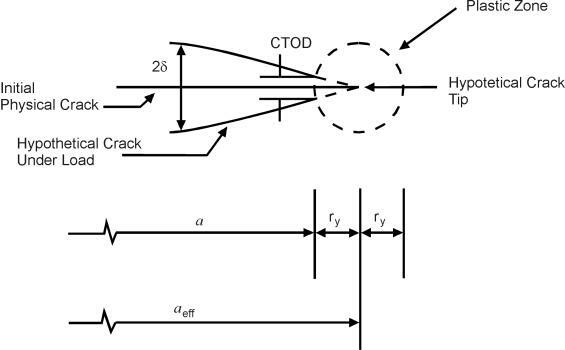 Thus, there is a direct relationship between CTOD and J throughout the region of applicability of the J-Integral and CTOD can likewise be considered a measure of the magnitude of the crack tip stress-strain field.